you live nor tapout? if so have to come for a ride with us oneday!! South of the river cheif,Either way we will have to catch up for a ride oneday. What size motor is in yours both mine are 110s. my provert has 125cc buying a bigger carb 4 her $160 then she go bit better. i love the novelty of minibikes we have races and just piss around all day on them. 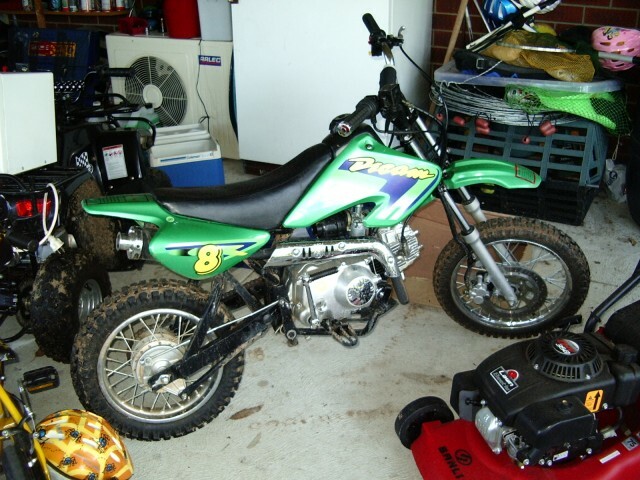 also cheaper to fix than my 600 if i drop it, plus its a good wheelie confidence builder. ill be up 4 a ride anytime mate! Have you seen 50 nuts street? are they the thumpster sized bikes? thinkin about post-poning my next rod and reel purchase to get one of thsoe 125 thumpstars, great fun! 50 nuts got it sik dvd. i have so many streetbike dirtbike minibike dvds its not funny! if ya chasing some let me know and ill burn some off 4 ya! a ridgy didge one or one of the cheaper copies from ebay ;) ?